Planning to open a medical website? Well, you definitely need to read this post then. 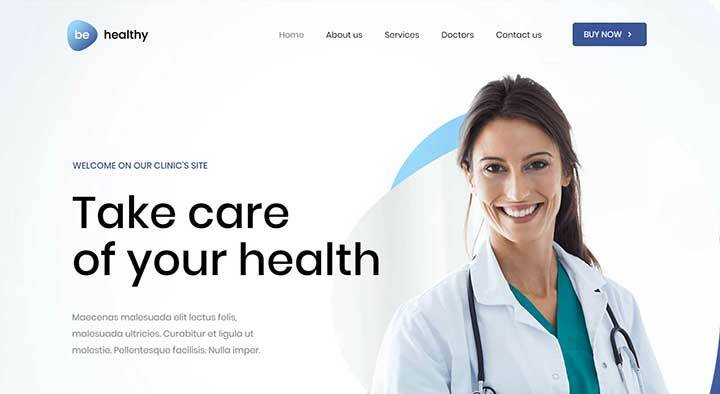 In this article, we have compiled a list of some of the best medical WordPress themes that can help you start your business. All the themes in this list are user-friendly, responsive and compatible with almost all modern plugins. By picking one of these themes, you can easily create a medical website and further customize its appearance to make it more striking. You will also get the best features for your website through which you can offer them the best user experience. MedicPress is a WooCommerce compatible WordPress health theme which is particularly designed to list pharmaceutical products for sale. The theme comes with a live customizer which allows you to make a swift alteration to the look & feel of the website and it gets updated instantly. MedicPress is translation & RTL ready, SEO friendly and optimized for high speed and unhindered performance. 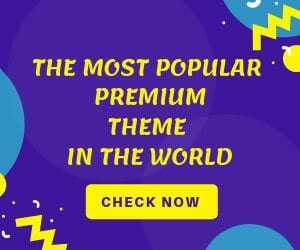 The installation process of this theme does not take more than a minute and also comes with the demo themes, video tutorials, custom backgrounds, mega menus and one-click access to updates & faster support. The pricing is categorized into to Annual & LIfetime packages. The budget package offers you 2 domains and the top-priced packaged gives you 5 domains. The basic of all the packages mostly remain the same. Divi is an extremely rich, fast & supremely intelligent drag & drop front end editor. The theme updates your customization instantly for the changes to be visible to you and your users. Divi is highly customizable. It comes with a wide variety of content elements, import/export settings, over 20 pre-made layouts with non-existent loading time. 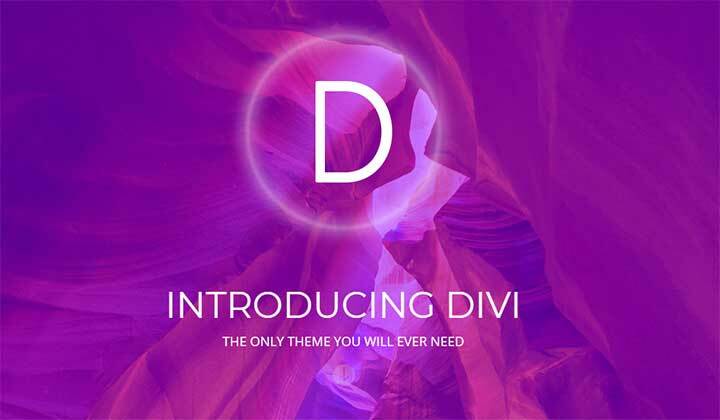 Divi’s exciting feature list comprises of an accordion, audio player, bar counter, blog,buttons, codes, comments section, contact form, email opt-in, gallery, image section, customizable user interface, portfolios, navigation, post slider, sidebar, post title, pricing table, social media sharing, sidebar, tabs, testimonial section, video and a lot more. All of the above, combined with an ever growing community to share information, a dedicated support system & moderation of client control access makes DIVI the ultimate tool. The pricing of DIVI is on the higher side but with a one-time payment, you can get a license to build unlimited sites. Bridge is a responsive multipurpose WordPress medical theme perfect for creating any kind of website. You are a creative, corporation, lawyer, medical doctor or freelancer looking for a sleek & stylish portfolio website or personal blog, Bridge has it covered for you. You need a one-page gallery, an app landing page, a restaurant, Bridge is peerless when it comes to offering you a superb website. Bridge is more than just a theme, it’s an assemblage of a ton of features. A whopping 374 demos, packed with 24 layout concepts, video tutorials, front-end login feature, power-packed admin interface, WooCommerce plugin, customizable header, title area, mega menu, video background, sticky & fixed header, AJAX & CSS3 animations, blog layout, sidebars, WPML, translation & RTL ready along with an undisputed support. Porto WordPress is a great business & woo-Commerce medical WordPress theme that is suitable for any business & Woo-Commerce sites. Porto offers plenty of elements & powerful features that can smoothen your website making process. Porto is perfectly optimized for speed & performance and has 3 powerful theme options. The theme is regularly updated, comes with multiple layouts for sliders, sidebars, category pages. The editing is undertaken by visual composer which on its own is a treat. Porto comes with a powerful admin panel, priority support, retina ready, demo content importer, CSS3 animations, unlimited colors & skins, 30 homepage layouts, 3 contact page layouts. That’s the end of the feature list. To get the complete info on Porto, click on the link and get your fill. 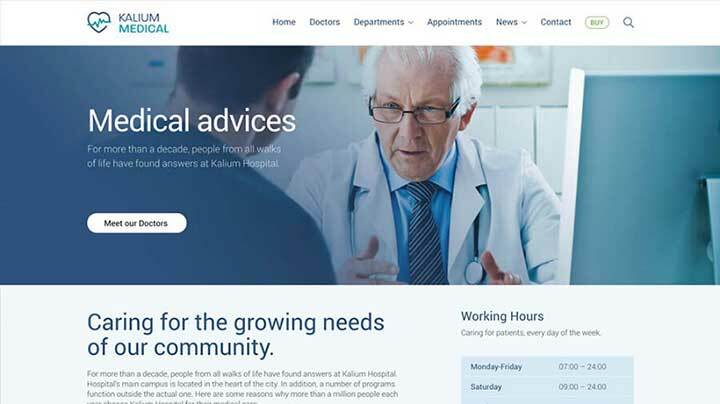 Kalium is a medical WordPress theme that will showcase your Portfolio, Agency, Photography, Corporate, Business, Construction, Law Firm, Product Landing page, Education, Wedding site or just your Blog. Everything is possible with Kalium. With a deck of layout designs, drag & drop content builder, custom widgets, multilingual skills, RTL Support, compatibility to WPML, shortcodes, over 30 portfolio styles, unlimited skins & styles, custom font,maintenance page, elaborate documentation, GDPR friendly, layer slider, custom, premium, Adobe & Google fonts are some of the exciting and equally useful features that you get. When you give a thorough look into the features & skills of Kalium, you will know that you can build whatever you like with this template. BeTheme is a light multipurpose WordPress Theme for health care centers. In the last 5 years of being active in the market, BeTheme has received over 150,000 successful sales and enjoys a massive fan following and appreciation. In the features section, it comes with 20 customizable header styles, logo, set colors, fonts, sizes, etc. BeTheme has a powerful admin panel full customization options, responsive & retina ready display, mega menus, video background, custom skin generator, CSS & JS, unlimited sidebars, colors, menus, Google Map styles & updates. It can be installed swiftly and packs a custom font uploader, SEO compatibility, maintenance mode page, child theme, inbuilt translator, over 200 shortcodes and compatibility to a wide array of widgets and all of this at a really sweet price. Jevelin is now one of the most popular multi-purpose WordPress medical themes available today. With an ever-evolving library of high-quality, professional website designs ready to be imported into your WordPress site in just a few clicks, Jevelin is the perfect tool to launch a wide range of websites in no time at all. The theme installation is literally one click away and then you get access to an array of website demos, undiscovered layouts & templates. All this can be customized to your taste using the drag & drop page builder powered by Unyson. You get a powerful admin panel, over 10 portfolio layouts, 6 blog layouts, custom port format, social sharing, a library of shortcodes, video background and child themes. This affordably priced theme gives you demo content & video tutorials along with, widgets and the access to 24×7 support & documentation. This is a WordPress theme for catering medical services such as Physiotherapy, Chiropractor, Sports Therapist, Massage Therapist, Rehabilitation, Medical Clinic & Private Hospitals. The process involved to get the site up & running feels close to a timelapse. It happens in minutes, thanks to the demo importer. Physio is WooCommerce compatible, responsive & retina ready, WPML & RTL supported. Among the many features, some of the best are its drag & drop page builder, custom page sidebars, stable coding, detailed documentation, live customizer, shortcodes, unlimited sidebars, custom widgets, Google Fonts and more. The feature list is very long and packed with useful stuff and that too at a great & affordable price. 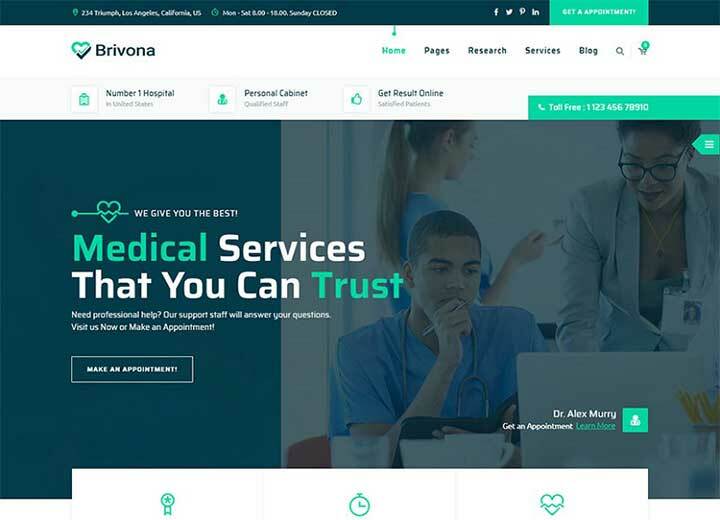 Brivona is a Premium WordPress medical theme that is a perfect elucidation for creating a professional website for Health & Medical, health clinics, medical practices, doctors, hospitals, pediatrics, psychiatry, surgeons, stomatology, chiropractor, dentists, psychiatrist, veterinary clinics Health, etc. Brivona theme is beautifully crafted with a unique design that is best suited for making an online presence in the healthcare industry. This medical services theme is 100% responsive and usable on all major browsers and devices. Brivona is based on Codestar WordPress Framework, comes integrated with bbPress, events calendar, WPBakery Page Builder, and Slider Revolution plugin. You also get features such as appointment/booking form, timetable, opening hours, department management. You get over 20 pre-made pages, one-click installation, more than 4 header styles, WooCommerce compatibility, unlimited colors, a bunch of premium plugins, powerful shortcodes, Google fonts, round the clock premium support are just to name a few. 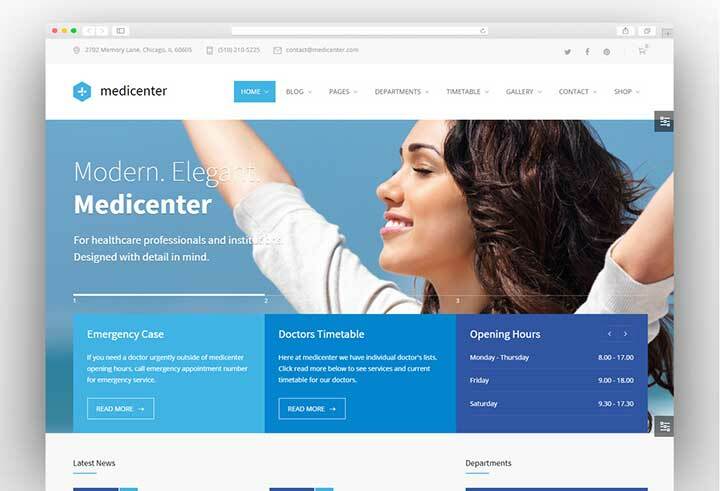 MediCenter is a WordPress medical theme targeted at the health care and wellness industry. It has been in the market for quite some time now and has garnered a handsome number of sales and appreciation for the facilities it has to offer. The layout of MediCenter is extremely responsive & retina ready. It offers a brilliant slider revolution, timetable builder, sticky columns, custom headers, color scheme manager, drag & drop page builder nd more. You also get over 60 content elements which again can be configured to suit the taste, premium icons and video pop-up feature, over 800 Google fonts, AZAX powered appointment & contact form and galleries. Installation and the demo content can be imported with just one click, PSD files included which can also be customized upon request. This medical WordPress theme is very affordably priced and with all those features in its kitty, it’s no doubt that MediCenter is among the top-selling medical WordPress theme. 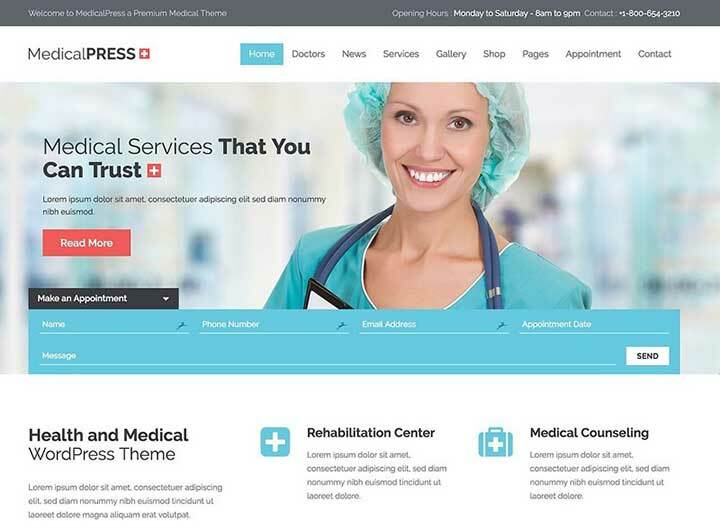 MedicalPress is an intricately handcrafted WordPress theme for the Health & Medical industry. It is a superb theme and is ideal for doctors, dentists, hospitals, health clinics, surgeons and other types of health organizations. 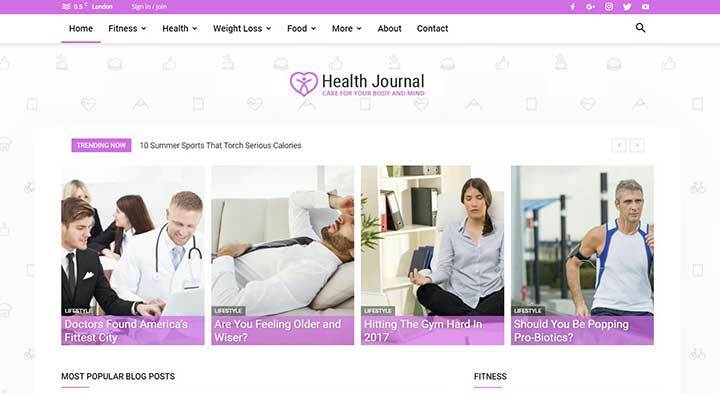 The design of this healthcare theme is very purpose oriented, the layout is responsive and has an array of special features to manage contents for Medical and Health websites. The theme supports 6 languages and you can get more languages upon request, WooCommerce & WPML compatible, 4 different appointment forms, multiple layouts, Visual Composer compatibility, SEO optimized. 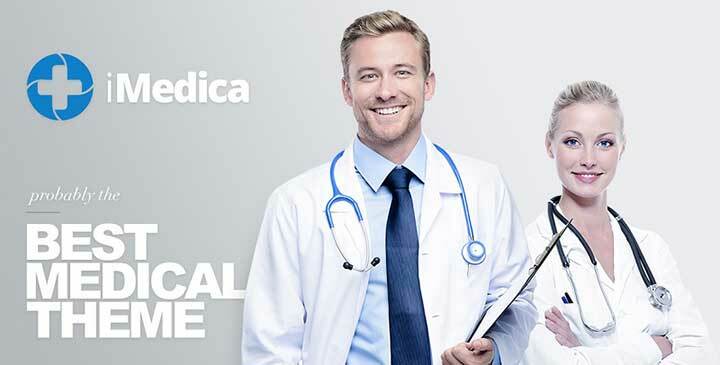 The price of MedicalPress is very affordable and over and above all these features and many more that could not be mentioned here, you also get detailed documentation and round the clock support. 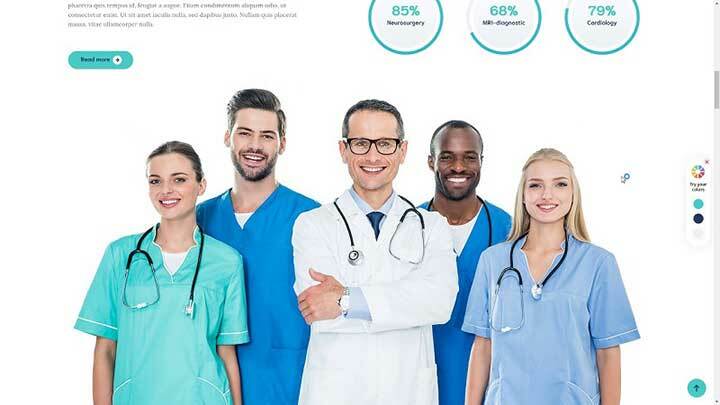 Healthflex Doctor features a unique design tailored to suit the online presence of hospitals, clinics, and medical service providers. It is versatile, multipurpose oriented with seven unique multi-page demos. It is suited for: Doctors, Medical Clinic, Health Coach, Healthcare Professionals, Physicians, Dentist, Dental Clinics, Medical Conferences, Veterinarians, Hospitals, Health Clinics, Pediatricians, Gynecologists, Diet & Beauty Specialists, Nutritionists, Dietitians, Personal Trainers, Fitness Coaches, Health Bloggers, and Yoga Professionals. The theme’s editing is taken care of by Visual Composer and drag & drop options, and the features include unlimited color variations, translation ready, WooCommerce compatible, ECWID shopping cart plugin, Google web fonts, OWL sliders, parallax & video backgrounds, CSS3 animation library, AJAX-powered page loading facility, post grid, teaser box and price plan shortcodes, one click demo import, detailed documentation and round the clock. 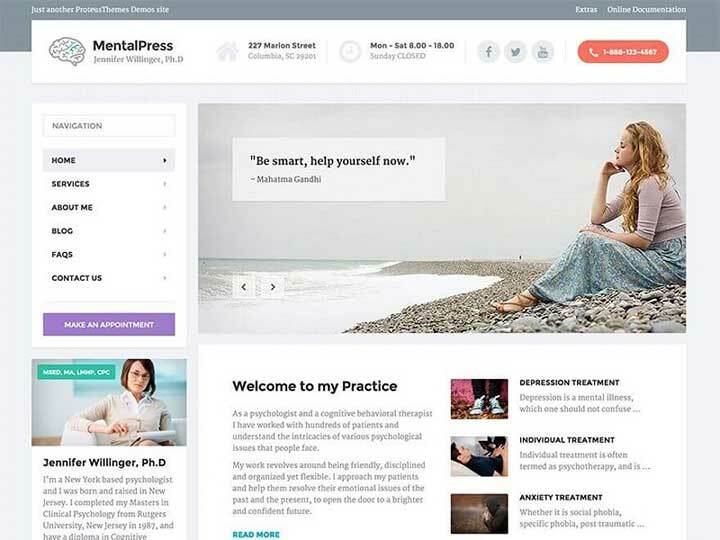 MentalPress, the name might not be catchy enough but it is sure to woo you with its features & capabilities. It is the perfect theme for psychology, medicine, counseling and behavioral therapy related web sites. First things first, the demo content can be installed and imported with just one click, the page builder working behind the scenes is very intuitive, the theme is very responsive and retina ready, has compatibility with WPML, WooCommerce, ECWID support & video tutorials, sidebars & widgets and supports some of the popular plugins. 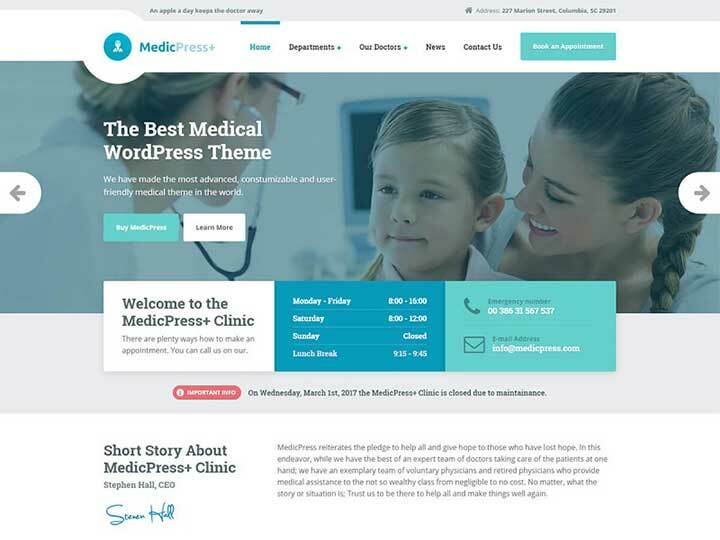 This medical WordPress theme is very reasonably priced and you will get all the above-mentioned features and a lot more which will empower to build an amazing website in no time. Ave can be called as the new player in the field of multipurpose WordPress themes. It is barely 4 months and it is definitely picking up the pace when it comes to sales. 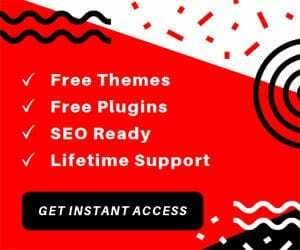 Ave comes with a bundle of premium plugins for free which reduces the effort when it comes to every aspect of the website saves quite a good amount of your money. You get different menu options for your mobile website, a behemoth collection of over 200 templates, 13 unique layouts, astonishing portfolios, detailed documentation with automatic updates. Compatibility to WPML, RTL and multiple languages along with newsletters and subscription features. Apart from these, you also get font & SVG icons, header builders, social media integration and access to very prompt and exclusive support. Newspaper is a WordPress medical blog theme specifically designed for the blogger community. The theme can also be used to create, news, newspaper, magazine, publishing and review site. NewsPaper supports videos from Youtube & AMP and it is compatible with the major social media platforms to allow content sharing. Newspaper comes header builder, a unique feature that allows you to make your own header for every content. Page building is done by tagDiv builder which is again unique to NewsPaper. The landing pages can be customized, it is mobile friendly, fast, SEO ready comes with over 10 author box layouts, packs a ton of premium free plugins such as AMP, currency exchange, weather, Instagram, social media, ad box, newsletter and so on. 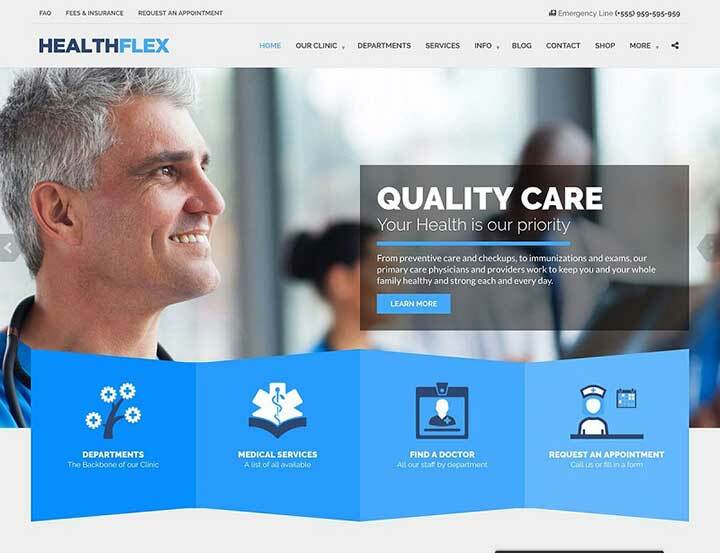 Are you looking for a comprehensive, clean and feature rich WordPress theme to build a website for the healthcare industry? Take a break and check out the iMedica theme. It offers you over 20 premade homepages which are unique and easily customizable, advanced admin panel, responsive design, header options with full width, boxed & fluid layouts. You also get unlimited font icons and sidebars, CSS3 animations, revolution slider and Visual Composer that takes care of all the editing that you wish to execute in your website. 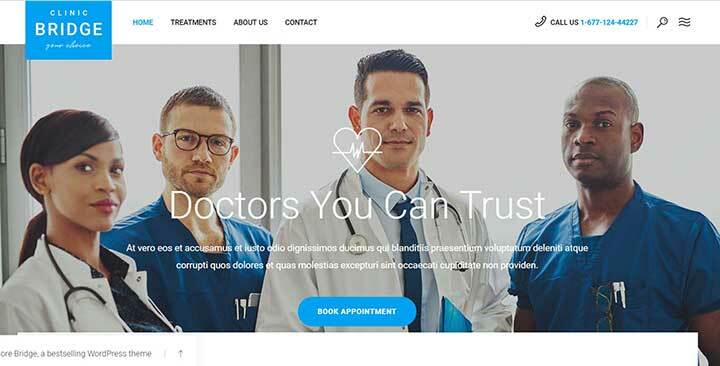 Upon purchasing this medical WordPress theme, you also get access to a few of the premium plugins and save quite a few bucks, detailed documentation and round the clock support. HolaMed is a health industry focused Multipurpose WordPress medical theme. This theme is apt for a medical clinic, diagnostic center, plastic surgery, massage, private clinic or private doctor, dentist, pharmacy, surgery, massage salon, medical blog, medicine, hospital, therapist, dentistry, and others. HolaMed is WooCommerce ready which allows you to list and sell medical equipment and offer health services to a wider range of patients. HolaMed comes a handsome collection of apex plugins, a color customizer, an effective admin panel, Google fonts, automatic updates, over 20 VisualComposer elements, 404 error page, one click demo installation, customizable content layouts, scrolling animations, shortcodes, galleries, blog, testimonial, product & service catalogs, product page, shopping cart, etc. 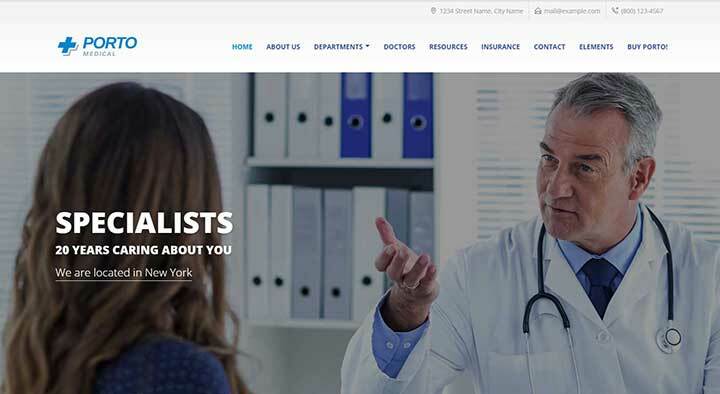 This medical WordPress theme is very reasonably priced and along with all those and many more features, you also get your hands on intricate documentation and assistance via 24×7 support. Exponent is a modern business-oriented WordPress theme for hospitals and clinics. It lets you build stunning performance driven websites using a full-fledged visual interface. The theme offers 22 premium pre-built demo websites, that can be used as the foundation for your website. The setup process is a cakewalk and the demo can be imported with just one click. You can create your personal blog, start an online store powered by WooCommerce, create amazing portfolios, galleries & carousels. The editing is undertaken by TATSU, a 100% visual page builder. You get to use 50 different styling modules, color gradients, CSS animations, GDPR compliance, round the clock support and a very, very extensive amount of documentation. Medin is an elite WordPress theme that includes 3 layouts namely Skin Surgery, Clinic, Dentist. Medin is retina ready, fully responsive and compatible with all kind of mobile devices. You can save your time and money with this WordPress theme. Among the exciting features, you get a timetable schedule for the doctors, booking forms, 2 types of galleries, WooCommerce integration, GDPR compatibility, testimonial feature, video tutorials. Also, our WordPress website theme Medin can be used in different colors schemes according to your requirements. 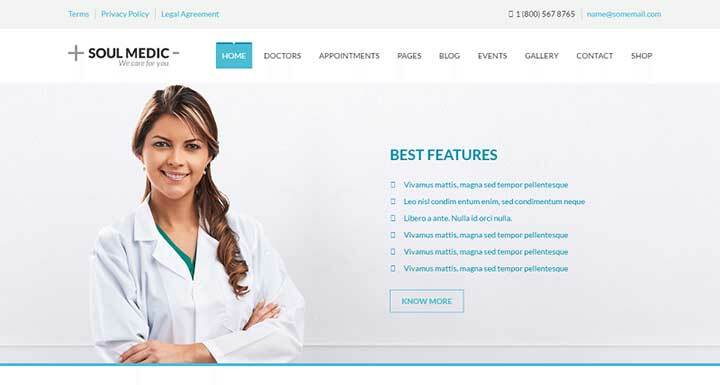 This medical website template is perfect if you wish to build websites for Medical Clinic, Plastic Surgery Center, Dentist cosmetologist, dermatologist, photodynamic therapy, body contouring, cryotherapy, skin surgery, laser treatment, medical restoration & rejuvenation, etc. 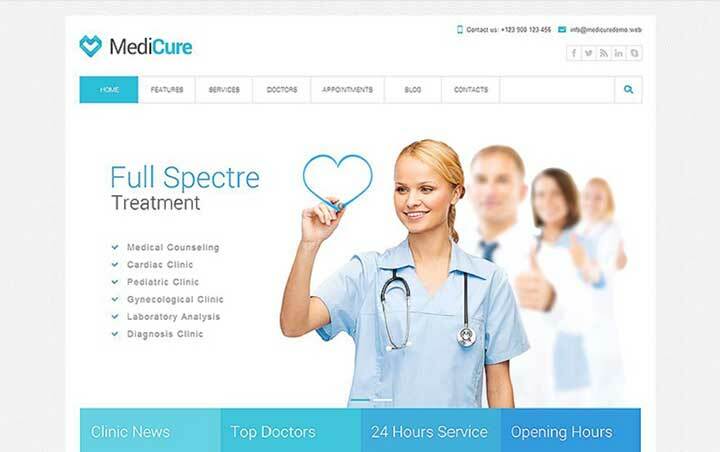 Medicure WordPress theme was designed to offer a flawless solution for medical websites. It features comprehensive functionality that was developed with health and medicine websites in mind. MediCure comes with all the compulsory features that are relevant to such sites. Custom Services, post type, fantastic flexibility, a really large set of custom shortcodes boosts the website manager to create highly unique and interactive content, regardless of it being the first experience of using a WordPress theme. In the feature list packs unlimited colors, custom admin panel, 23 curated shortcodes, custom form builder, extremely responsive layout, custom background, custom widgets, layer & revolution slider, drag & drop content composer, a detailed knowledge for the theme, advanced SEO, custom page backgrounds and much more at a very pocket friendly. Simple, clean, minimalist & modern styled are some of the word synonymous with SoulMedic WordPress theme. with a feature rich admin panel to conduct a quick install of the theme. SoulMedic also comes with the wide and unique boxed layout, both fully responsive and optimized for all kind of devices and compatibility to all major browsers. 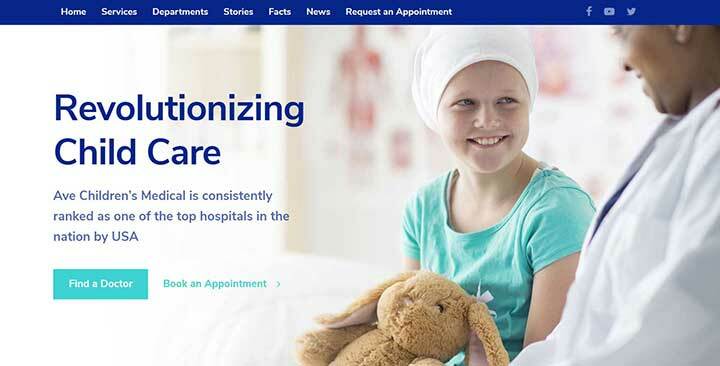 This hospital WordPress theme is packed with over 25 different page layouts such as doctors, departments, services, blog with comments, about page, events or schedule pages, event detail page, gallery with and without sidebar, 2,3,4 column content, contact, appointment etc. It is a most suitable theme for doctors, dentists, surgeons, hospitals, health clinics and any type of health and medical related websites. The theme is also WPML & multilingual compatible, and you get events calendar, theme customizer, mega menus, RTL support, 20 predefined skins, multi-blog columns, 6 types of template pages & 5 types of custom widgets, typography setting, Google fonts. 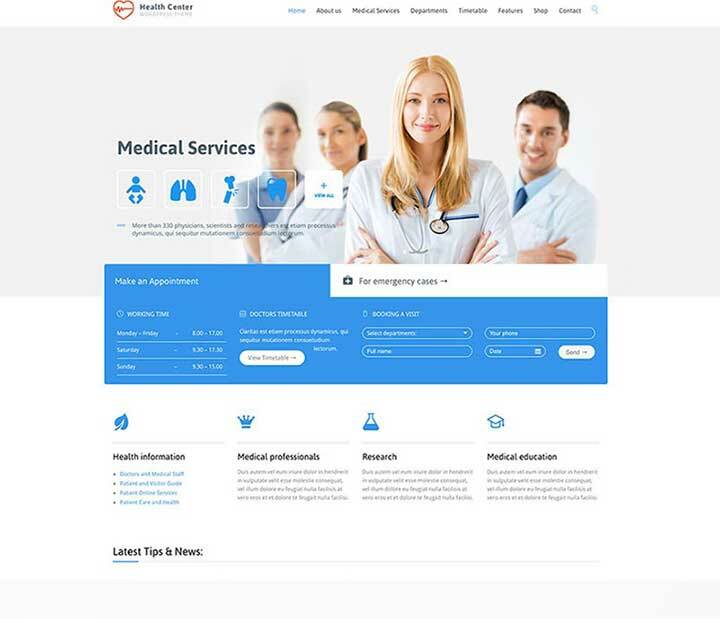 Medical & Dentist is a theme built for medical practices, dentists, doctors, surgeons, hospitals, health clinics, pediatrics, psychiatrist, psychiatry, stomatology, chiropractor, veterinary clinics and other medical related practices. But that’s not all, it is also suitable for websites related to the conference, environmental, charity, nonprofit, gym, parallax, political, activist, cause, one page, business, spa, and shop. One thing that Medical & Dentist truly excels in is its customer support and efficiency when it comes to resolving issues. It is absolutely unparalleled. The layouts offered are endless and you also get 10 header & 20 footer layouts. Over 600 Google fonts and 30 ready-to-use and customizable pages with unique and amazing designs. Medical & Dentist is SEO friendly and translation friendly and the demo content can be accessed with just one click. If you are a beginner, then don’t worry as you also get the video tutorials in the package and at a really fantastic deal. 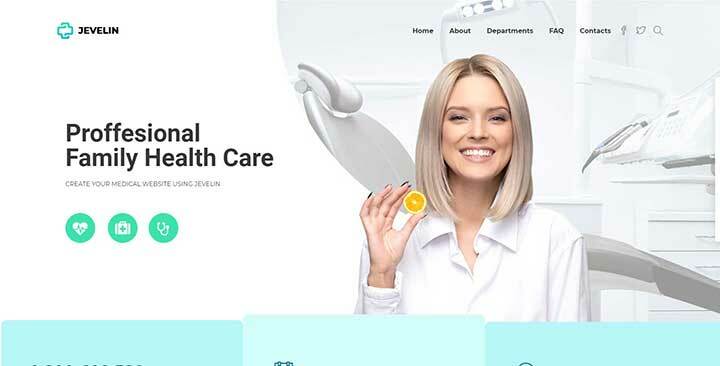 Dent-All, a WordPress theme for dental and other medical services comes with formidable built-in plug-ins and custom modules which makes website designing a walk in the park even for someone with no coding knowledge. Some of the exciting features that you get with this theme are revolution slider, appointment booking, visual composer for page editing and customization purposes, pricing module, custom services module, staff & doctors personal data, description, photos of your clinic, certifications, contacts, etc. This WordPress theme is fully responsive and 100% Retina-ready. This allows your patients to make appointments using mobile devices too. This is a theme where you can customize the content and sections to adapt to your business needs. Among other features you get, 4 color options, 2 service listing layouts, one click demo import, visual composer, slider revolution translation ready and much more at a very affordable price. 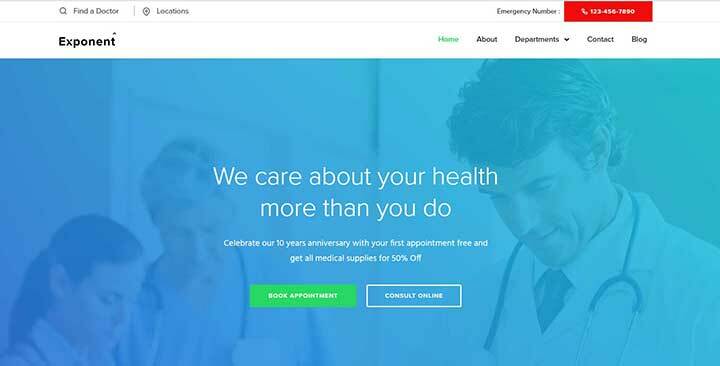 Any Other Health Care WordPress Theme? We hope you like our collection. Do not forget to tell us which one was your favourite and why. If you think there is a better option that we missed out, do let us know. We would love to add them.